« Indie Publishing News is out! Don’t you just love having guests over? 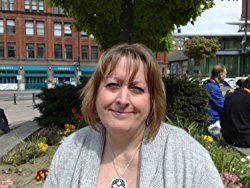 It is wonderful to be able to introduce you to another author whose books might just tickle your fancy – Karen J. Mossman. I come from a family of journalists, but am the only one to have gone into fiction. My first book was published in 2014 and this year I hope to write the sequel to that. I live in Anglesey, a small island off the North Wales coast with my husband and elderly Yorkshire terrier. We have two children who were born on the same day two years apart and ironically 2lbs different in weight. At the time we lived at house number 22. It’s a pity they didn’t have the lottery back then! Although I always considered myself blessed and lucky with them and I now have two grandchildren. Because when I write I can do anything and be anyone. I can also go anyway I like – and I can even get away with murder! When I first began writing, I really didn’t know what I was doing and published 3 themed short story collections. As I met other authors and learned more about my craft, I realized these books needed rewriting and reformatting and I got them great new covers. For the last 6 months, I’ve been doing this. The Missing and Heroes are out, and I am just doing the final checks on Behind the Music. I was pleased to be able to add a brand new story to include with this one. What is your favourite character among the ones you created? Tommy who is the boyfriend of Kerry in The Secret. He’s everything I would love in a man and he adores Kerry and just wants to look out for her, especially when he realizes she is in trouble. What was the most difficult thing for you to write so far? Some of the scenes from The Secret. I don’t want to give anything away, but some were harrowing and my only experience was my imagination. I have my next two books planned out. Joanna’s Destiny is the sequel to Joanna’s Journey followed by a completely different book set in medieval times. What makes you happiest in the writing process? Writing early in the morning without interruptions and realizing my muse is fully awake and my fingers and just keep on tapping on the keyboard with a life of their own. 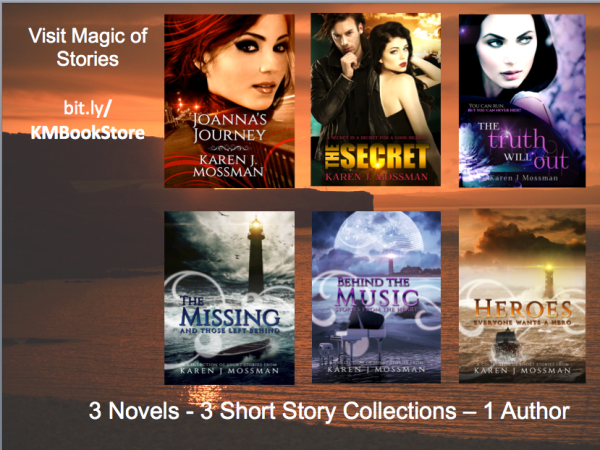 Then like magic, a story has appears – I love it when that happens. If you didn’t write, would you try any other arts or crafts? I’ve always loved cross-stitching and now I have two grandchildren I have started knitting and have just learning to crochet. So far I have made a knitted teddy and am crocheted blanket. Now I’m starting on a bobble hat. What was your favourite book when you were younger or a child? Why? It has to be Enid Blyton’s Famous Five books. I remember turning the page at Chapter 1 and feeling so exciting to start a new adventure. Thank you for your time, Karen. A brief reminder to readers – if you like what you read, do leave a review at the purchase site and/or a book club. It helps authors a lot. Reblogged this on The Magic of Stories.